Before you knew you were to become the next Fat Boy Slim DJ, where could you hone your skills? Answer – The Fisher Price record player. Yes when it came to scratching, these were indestructible. With bright colours and songs to drive you and the family crazy, this was the deck to have. It’s so good its now become availble again. Talk about nostalgia. Kids today wouldnt know anything about “dust on the stylus”, but this may just be what they need to understand why dancing near a record player was a no-no unless you wanted it to skip a beat. Each record was a different colour and had an A and B side.10 songs on 5 records that are stored inside the music box. The record player was first introduced by Fisher Price in 1971. 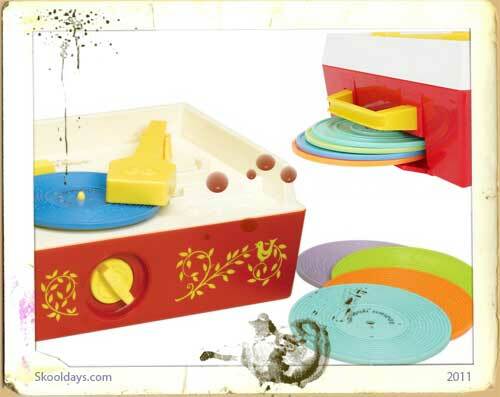 The toy features a classic wind-up mechanism that plays the records as they spin around the turntable. This entry was posted in PopMusic, Toys and tagged 1960, 1970 by Skooldays. Bookmark the permalink.